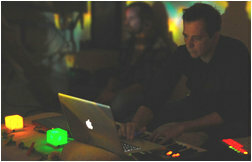 Dreamhub is the project name used by Danish composer Kim Pedersen for his electronic ambient productions. Kim performs his deep, meditative journeys into audio atmospheres, working with both electronic and organic elements in his compositions, which often serve as a catalyst for the listener to delve into inner worlds and afterthoughts. Kim has been developing the music of Dreamhub since he was first invited to play at The National Cathedral of Denmark in late 2008. On December 13th, 2009, Kim performed live on national TV (broadcast worldwide) during the official opening ceremony of the COP15 United Nations Climate Change Conference, which featured Desmond Tutu and Rowan Williams, amongst many others. Kim has played and composed music since childhood. He says: “In recent years I have felt most comfortable with finding this ambient and meditative style and approach to composing. I really enjoy spending hours tweaking sounds, effects, frequencies - and all the other aspects of composing and producing electronic music”. You can experience Kim and Dreamhub live once a month in The National Cathedral of Denmark, where listeners chill out on the benches and couples, families, homeless people, tourists - anyone dropping by - are often attracted by the calm and soothing atmosphere created by the electronic adventures of the Dreamhub. The Dreamhub experience is often described by listeners as “really nice and calming”, “fantastic”, “dreamy” and “out-of-this-world”. Kim is inspired by and grateful for the influences of, amongst many others, Carbon Based Lifeforms, Bluetech, Jean-Michel Jarre, Ian Boddy, Klaus Schulze, Kitaro, Tetsu Inoue, Pete Namlook, Steve Roach, Biosphere, and many other artists. Inspiration also comes from walking in the woods, sitting by the beach, stargazing at midnight, meditating, and from many years of Tai Chi Chuan practice. Kim is also part of the performer line-up at the 2010 Electronic Space Music Festival and Concert in Arcosanti, Arizona. He has a broad web presence, including his home page, Myspace page, Twitter feed, Bandcamp page, and YouTube page. Earth Mantra is very proud to be bringing our listeners the music of Dreamhub, and we hope to hear much more from this talented artist in the future.